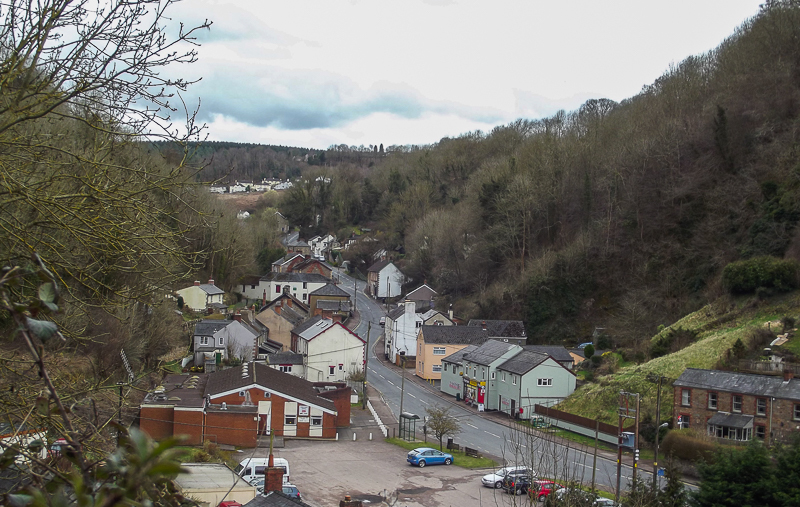 Central Lydbrook, where I terminate my shorter runs. 10 minute easy run on Wednesday was an easy jog through the village, reaching further than before, so some improvement. 20 minutes in the forest on Friday, witnessing the arrival of spring as I jogged along the tracks. Due for 15 minutes today, but did that indoors due to the inclement weather. It looked as though the rain was set in for the day. But this afternoon brought a break in the clouds and rain, so we walked to the lower end of the village along the hillside tracks; a return trip of around 2 and a half miles over fairly steep trails. Ended up back at the foot on the hill that leads to our house and found the local pub there open. The Jovial Colliers sells real ale and serves food on Friday and Saturday nights, so we’ll probably be popping in more frequently, now that we’ve met the landlord and some of the locals. A nice pint of 6X for me, Valerie’s signature brandy and lemonade. The rain has returned with a vengeance as I write this. The editing continues to go well. The first edit is complete and I’m about a third of the way through the more detailed edit, with Valerie performing the function of nit-picker and grammar police for me. She has an excellent memory, an eye for repetition and inconsistency and a damned good working knowledge of English grammar, so she’s an ideal pair of eyes for this stage. Once I’ve finished this phase, I’ll be sending the book off to a handful of beta readers for their input. Hopefully have this on the shelves before the end of April. We spent a good deal of this week in clearing the remainder of the brambles, weeds and undergrowth from the jungle that was the lower half of our back garden. A necessary task undertaken during the good weather so we can start to plan on the terracing, fencing, new steps and planting in time to enjoy the garden this summer. If you’d like to contribute to my fundraising efforts for Action For M.E., please click this link and take the easy steps to make a donation. Thank you. It’s the village where I live, Sue, so I hope not! Yes, I know. I meant “fictionally speaking”. Any neighbors rub you the wrong way? I’m kidding! Neighbours and friends beware! I’m a writer, and any of you may be my next subject. That’s a;; I’ll say. The pic at the top of the post is great fodder for creativity. Perhaps a grisly murder takes place there?